UCHealth aims to spark a conversation with patients about opioids. This banner shows one of the public service messages in a lobby at UCHealth University of Colorado Hospital. Photo by Dan Weaver, UCHealth. We’ve all had that healthy conversation, that wonderful talk that changed our lives. Inside hospitals across Colorado, UCHealth is adorning elevators, welcome desks and hallways with public service messages about opioids to spark conversation about the dangers of opioid use and to encourage behaviors to prevent addiction. 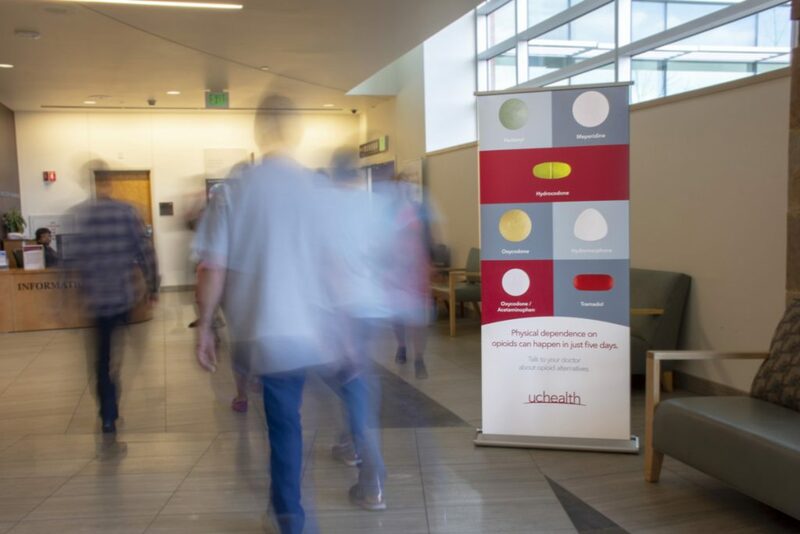 UCHealth aims to spark healthy conversations about opioids through public services messages posted in hospitals. It’s no secret that the misuse of prescription opioids is an epidemic in Colorado and the United States. The numbers of people who die each year or overdose on painkillers is staggering. UCHealth has launched a number of initiatives to address this public health crisis. The reminders inside its hospitals are one part of that effort. Participating in the Colorado Prescription Drug Monitoring Program, which helps reduce prescription drug misuse, abuse and diversion and helps physicians make more informed decisions when considering prescribing or dispensing a controlled substance to a patient. Embedding of a clinical support tool into the everyday workflow for physicians and advanced practitioners. The tool allows physicians to see alternative medications to treat pain. If opioids are needed for acute pain, the number of pills prescribed is limited. Included in the database is scripting for physicians so they may clearly communicate why a medicine other than an opioid is being prescribed, and how it is effective and less addictive than an opioid. Prescribing buprenorphine for patients who are addicted to opioids and indicate they would like to stop taking opioids. Patients who are prescribed buprenorphine do not get a feeling of well-being or a high from the medication, making it ideal for treating narcotic addiction. Participating in 2017 in the Colorado Hospital Association’s Colorado Opioid Safety Pilot, a study that was conducted in 10 hospital emergency departments (EDs) over a six-month span with a goal of reducing the administration of opioids in those EDs by 15 percent. The hospitals achieved a 36 percent reduction in the administration of opioids during those six months, as well as a 31.4 percent increase in the administration of alternatives to opioids (ALTOs). Administering a random drug screening program for all physicians, advanced practice providers and all UCHealth employees who work in positions or areas that give them access to opioids. UCHealth is one of the first systems in the nation with a random drug screening program that includes both employees and providers. While millions of prescriptions for opioids are rightly prescribed for pain, physicians across the nation – and at UCHealth – are prescribing them much more carefully. “We recognize that while there is a role for opioids at times, there are also alternatives. When it does make sense to use opioids, we should be thoughtful about using the lowest dose of opioid for the shortest period of time to keep people safe,’’ Dr. Kutner said. UCHealth’s public service campaign, initially designed by Intermountain Healthcare, provides messages about opioid misuse and addiction; how to talk to your doctor about alternative forms of medication; and proper disposal of unused medication. Dr. David Steinbruner, an emergency room physician and chief of the medical staff at UCHealth Memorial Hospital, said providers see people every day who are struggling with opioids. “We continue to see the tragic results from the ongoing opioid epidemic. There is no community that has not been touched by it. Patients come from all walks of life and economic circumstances. The reasons for their addiction are as varied as the people affected. “We see it in destroyed relationships, marriages, families and premature deaths of the very young and the very old. The demand on emergency departments and EMS is tremendous and much time and treasure is spent trying to stem the tide of this,’’ Steinbruner said. What’s the plan to taper me off the medication? 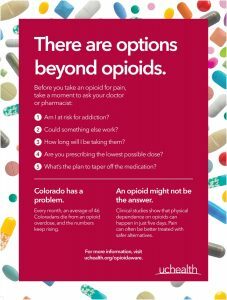 A message that will hang in UCHealth hospitals encourages patients to talk to their doctor about opioids. In 2015, approximately one Coloradan died every 36 hours from an opioid overdose, according to data from the Colorado Department of Health Care Policy and Financing.